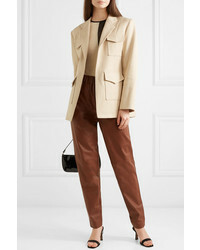 If you're scouting for a casual yet incredibly chic outfit, consider wearing a Georgia Alice Cotton Blend Twill Blazer from NET-A-PORTER.COM and tan wide leg pants. As well as totally comfortable, these two items look fabulous together. Dress down this look with black and white leather low top sneakers. 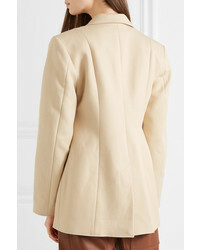 A Georgia Alice tan blazer and white flare jeans have become an essential combo for many fashion-savvy girls. Let your outfit coordination prowess really shine by finishing off this ensemble with a pair of white leather loafers. 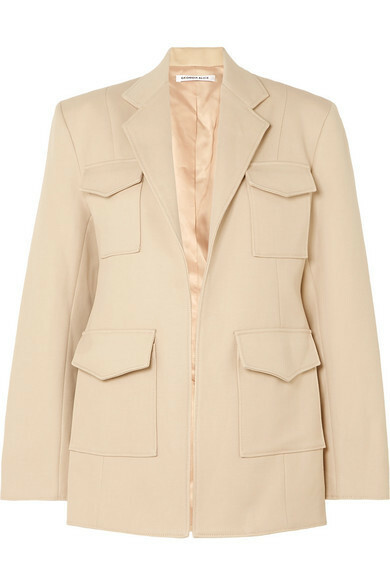 A Georgia Alice Cotton Blend Twill Blazer from NET-A-PORTER.COM and white capri pants are wonderful must-haves that will integrate really well within your current styling arsenal. For a more casual finish, throw a pair of white leather high top sneakers in the mix. Pair a Georgia Alice Cotton Blend Twill Blazer with navy skinny jeans for a straightforward look that's also put together nicely. As for the shoes, you can take a more classic route with black and tan leather pumps. For a casual chic look, pair a Georgia Alice Cotton Blend Twill Blazer with navy dress pants — these pieces play really well together. If you're not sure how to finish off, a pair of black leather pumps is a good option. This combination of a Georgia Alice tan blazer and light blue ripped jeans is effortless, stylish and oh-so-easy to imitate! 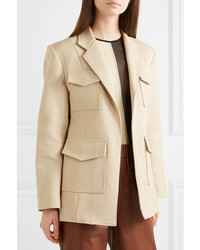 If you're on the lookout for a casual yet stylish getup, marry a Georgia Alice cotton blend twill blazer from NET-A-PORTER.COM with a light blue pleated mini skirt. Both pieces are totally comfy and will look fabulous paired together. Dress up this look with black leather heeled sandals. A Georgia Alice Cotton Blend Twill Blazer and white tapered pants are absolute must-haves if you're crafting an off-duty wardrobe that holds to the highest fashion standards. Avoid looking too formal by rounding off with white leather wedge pumps. If you're looking for a casual yet totally stylish ensemble, consider pairing a Georgia Alice cotton blend twill blazer from NET-A-PORTER.COM with blue skinny jeans. Both pieces are totally comfy and will look fabulous paired together. You could perhaps get a little creative when it comes to footwear and spruce up your getup with tan leather heeled sandals.